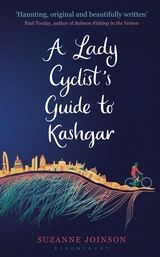 Timeslip novels can be frustrating for readers who become engaged with one set of characters and find the other little more than an intrusion, but in Suzanne Joinson’s first novel, A Lady Cyclist’s Guide to Kashgar, the shared themes are so neatly woven together that both parts of the narrative are equally satisfying. The lady cyclist of the title is Evangeline English who travels to Kashgar in the 1920s with her eccentric sister and an even more eccentric proselytizer, Millicent Frost of the Missionary Order of the Steadfast Face. A century later, Frieda Blakeman is struggling to make sense of life and love in London, when she is asked by a local authority to clear the flat of a dead woman of whom she has never heard but who has given her name as the next-of-kin. Joinson’s style is a charming mixture of languid, sensuous description and witty conversational exposition that involves the reader in the characters’ many dilemmas, without slowing the pace at all. Frieda is herself a traveller and her life is transformed by the appearance of a homeless Yemeni man on her doorstep. Exile and the difficulty of finding a way to live in an alien culture link the scenes in Kashgar with those in London so many decades later. As Frieda investigates the dead woman’s identity and history, while trying to understand her own self and her past, Evangeline faces increasing threats from both nature and the resentment of the locals whose religious faith Millicent intends to overcome and change. The two narratives loop and twine around each other, offering the clearest possible demonstration of the fact that those who are convinced of the rightness of their own views are not only vain and self-indulgent but also dangerous. The pleasures provided by this novel don’t end with the last page. Its characters are strong enough to leave the reader with plenty of ideas to think about.